My purpose for last week’s message, “Are The Greatest Commandments Greater Than The 10?”, was to emphasize the importance of focusing on loving Jesus rather than following the laws of Moses. Paul makes it very clear that we are not to forget the law, but that our faith in God is infinitely more important than obeying His laws. Faith comes first, only then will we develop the ability to obey the law through being transformed. The focus though, is to please God out of our love for Him, not to obey the law. Romans 3: 31 Well then, if we emphasize faith, does this mean that we can forget about the law? Of course not! In fact, only when we have faith do we truly fulfill the law. I find this passage very interesting. Jesus first of all makes it clear that no one is good (All have sinned Romans 3:23). Then after checking off a list of commandments, the man states that he’s obeyed them. After that Jesus seems to ask the man to do the one thing he wasn’t willing to do. I believe that we can surmise from this that the man’s sin was idolatry and it kept him from being obedient. The disciples were willing to walk away from their soon to be former lives to follow Jesus, but this man was not willing. But Jesus’ instructions did not end with “Sell all your possessions and give the money to the poor”, that was what he would need to do, in order to do what Jesus requires, which is to follow Him. That being said, I think it is far more difficult to follow Jesus than it is to obey the 10 commandments, but it far more worth it. Mark 8: 34 Then, calling the crowd to join his disciples, he said, “If any of you wants to be my follower, you must turn from your selfish ways, take up your cross, and follow me. The rich man was obeying Moses’ commandments, but when it came to following the Messiah, forget it. He didn’t even realize that his very own “riches” were an obstacle. Every other religion and belief system is all about “do this”, or “do that” to achieve Nirvana or “the next level”. Jesus never makes it about what we can or can’t do, He wants our hearts and for us to have faith in Him. Just like a daddy wants the hearts of his son or daughter more than for them to just clean their room. This is so fundamental to our faith and sets us apart from everyone who is not following Jesus. Romans 4: 5 But people are counted as righteous, not because of their work, but because of their faith in God who forgives sinners. What does that mean to you? What do you think about when you read those words? Are you following Him now? And what does that look like? 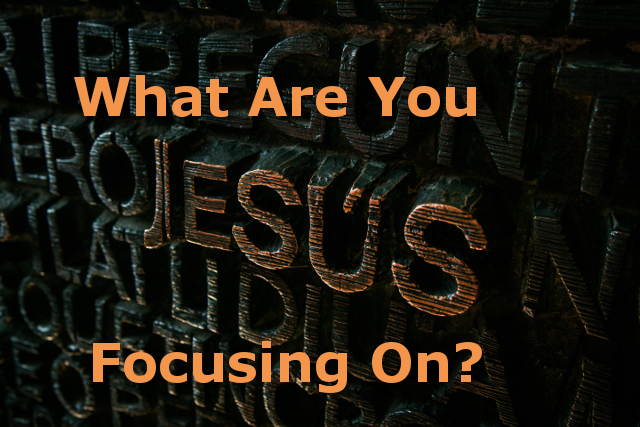 Are you focusing on Jesus or the law? When we follow Jesus, we learn how to know Him on a personal level, have a greater peace and learn what true joy really is. This also simplifies our lives. If our prime directive each day is to evaluate each decision based on the two greatest commandments then our decision making is easier. When I focus on the Ten Commandments (the law) it is always about my ability or inability to live up to them. If I’m doing a good job of following them, then I start to become proud and it’s all about me. If I’m not doing a good job of following the law and sinning out of control like a reckless maniac, I’m full of guilt, become angry at myself and others, and again, it becomes about me. Do you see then the focus starts with the law and before I know it the focus is on me and my problem? This is stressful and the Christian life should not be this way. This also naturally leads to the comparison with others. If I’m following the law, I become inclined to see other’s failures to do what I can do. This leads me to be boastful. If I see others obeying laws that I struggle with then I might think “If only I was as good as Joe is…” What a horrible place to be. This is a childish way to live our lives and is an endless game of comparison and trying to live up to some standard that I cannot. This is not restful in the least. I grew up with this way of judging myself and others based on performance. Matthew 7: “Do not judge others, and you will not be judged. 2 For you will be treated as you treat others. The standard you use in judging is the standard by which you will be judged. You won’t find forgiveness in the law. The more I follow Jesus, the more my “selfish ways” becomes clear to me. I become very aware of my “issues” and this allows me to have more compassion for others as I know Jesus has so much compassion for me. There is no forgiveness in the law, but Jesus is all about forgiveness, but that does not mean we take advantage of this freedom. 16 So the promise is received by faith. It is given as a free gift. And we are all certain to receive it, whether or not we live according to the law of Moses, if we have faith like Abraham’s. For Abraham is the father of all who believe. When I came to the realization that God cares more about my relationship with Him than my ability to lead a sin-free life it released a heavy burden and allowed me to accept my weaknesses for what they are. This does not mean I become comfortable with my “problems”, it just means He still has work to do in my life. The closer my relationship with Him becomes, the more sorrow I have over my sinfulness. 1 Thessalonians 5: 23 Now may the God of peace make you holy in every way, and may your whole spirit and soul and body be kept blameless until our Lord Jesus Christ comes again. 24 God will make this happen, for he who calls you is faithful. Remember that we are broken and it’s His job to fix us, not ours. He is the Healer, we are not. When we continue to follow Him, He will heal us in many ways, on His terms, and in His timing. Before, when I did not have this relationship, the sin in my life pushed me away from God because I did not know Him well enough, but now that I know Him I know that what He truly wants is my love, which yields thanks and praise. Now when I sin, whether it is deliberate or not, I have a greater desire to repent of it and come crawling back to Him, asking for His forgiveness. Oh, what a joy that is! And you forgave me! All my guilt is gone. 1 John 1: 8 If we claim we have no sin, we are only fooling ourselves and not living in the truth. 9 But if we confess our sins to him, he is faithful and just to forgive us our sins and to cleanse us from all wickedness. 10 If we claim we have not sinned, we are calling God a liar and showing that his word has no place in our hearts. Do you see how this personal relationship with Him makes all the difference? Are the Greatest Commandments Greater Than The 10?